Taking care of a dog is not just about feeding it, bathing it, and walking it. Dogs have other issues that an owner must take care of as well, which includes tick prevention. After a dog gets a tick, it becomes an incredibly frustrating process to get rid of it. If left too long, your pet might even get ill. The best tick control for dogs is to keep them from ever becoming infected with by turning to proven tick repellants and prevention medicines. Finding the best tick protection for dogs can be overwhelming and stressful, but figuring out what is the best tick treatment for dogs does not need to be as complicated as it has been in the past. The best dog tick prevention for most owners is easy to use, affordably priced, and effective. When it comes to choosing the best tick prevention for dogs like yours, consider what kind of areas your dog is in, the climate you live in, and the types of medicines that have an application cycle and method that will fit into your lives. At the top of my list is the spot-on treatment made by K9 Advantix. This is a brand that owners have been using for years, and while it’s not all natural, it is totally effective. And when it comes to topical brands, this is one of the most affordable. 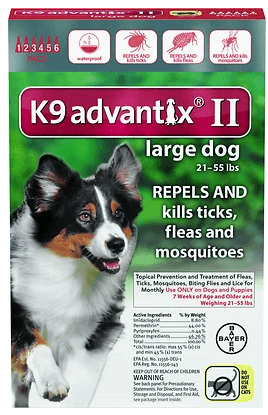 K9 Advantix is typically applied monthly, topical formula that includes imidacloprid, permethrin, and pyriproxyfen to prevent fleas, ticks, lice, and parasites from surviving on your pet. When it comes to ticks, this medicine will keep deer ticks, American dog ticks, Brown dog ticks, and Lone Star ticks away from your pet. Another great spot-on treatment option, which are known to be the most effective prevention method, is the Frontline Plus Flea & Tick Treatment medicine. Frontline Plus is very similar to K9 Advantix in how it is used, but it’s usually a bit more expensive. Both are applied topically every month to keep your pet safe. 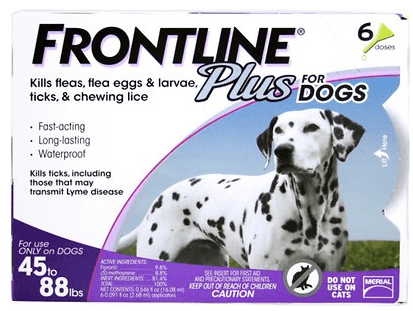 The active ingredients in Frontline Plus uses are fipronil and (S)-methoprene. These two ingredients kill fleas and ticks and then deals with eggs and larvae, too, so that your pet will be flea and tick free for The 1st, fipronil, kills adult fleas and ticks. The 2nd, (S)-methoprene, attacks flea eggs and larvae. 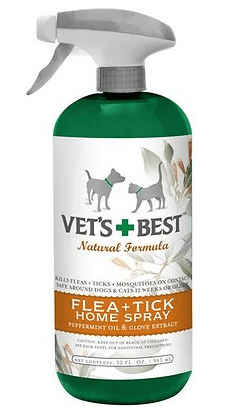 This is one of the best tick killer for dogs that have spread fleas and ticks in your home because it can be sprayed on furniture as well as on pets. This is a great way to ensure that fleas and ticks don’t break through your preferred treatment method. Use it in conjunction with another method if your pets are particularly at risk for ticks or spend a lot of time in high-risk areas. This spray can be used exclusively in your home, or you can also use it on your pets to get rid of and repel fleas. I found that using this at home and spraying danger zones likes your dog’s legs when they head outside prevents any stragglers from getting your dog, even if you’re already using another flea and tick prevention method. 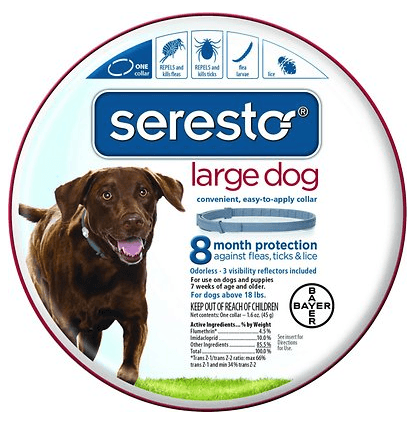 Another great option among the best dog tick prevention methods can be used exclusively, or it can be used to supplement a spot-on or capsule tick medicine: Seresto tick collars! These collars are worn for up to 8 months to prevent tick and flea infestations. These are a great option or owners who cannot do a daily or monthly supplement. Like other tick medications, they come in different products for different sized animals. It uses medicines often included in topical treatments (imidacloprid and flumethrin) which work to repel and kill fleas and ticks. While this isn’t the cheapest collar out there, it is much more effective, so you will have fewer problems to deal with if you invest in this collar. The best tick medicine for dogs often include chemicals that some pet owners don’t like to use. While I personally think that the above medicines are OK to use on your pet, I respect that other owners prefer a more natural approach. 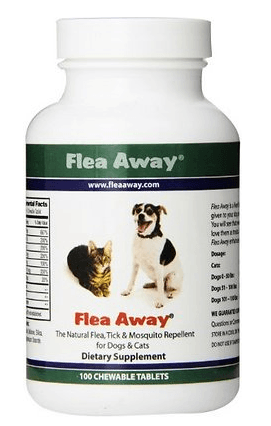 When you’re looking for a natural flea and tick repellent, Flea Away chewable tablets are a good choice. This medicine uses a vitamin complex to promote your dog’s ability to repel fleas, ticks, and mosquitos, and it also promotes a healthy, shiny coat of fur. While this product is effective, I believe it’s best used in combination with another method of protection outlined above to ensure 100% effectiveness. This way, you'll have ease-of-mind knowing that your pet's risk of infection is lower than using only one prevention method. Just be careful not to overlap active ingredients! No matter what type of tick protection you use, you’ll be able to rest easy to know that your dog is safe from the diseases and issues that ticks cause. The easiest way to prevent ticks is by choosing a method and sticking to it. There are many effective prevention medicines, but you need to stick to one to keep it working well. Act now to keep them safe from future problems! I just used this for the 1st time this past weekend on an overnite stay at our property. I put drops on my shephards collar, and base of her tail. I pulled 2 ticks off her neck fur beneath her ears after arriving home. Any advise here?